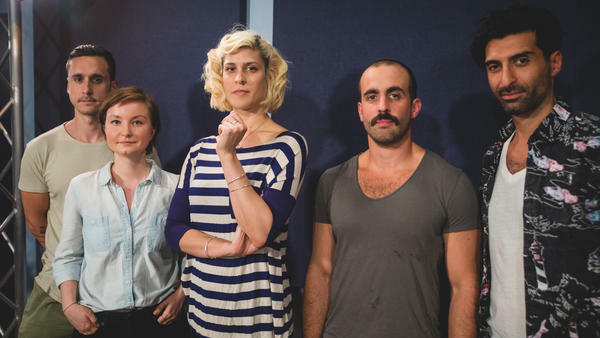 Dessa (center) and her band inside the World Cafe Performance Studio. Can you insure your heartache through GEICO if you use it as a professional asset for writing songs? If you're a self-proclaimed "bottle-blonde, fair-skinned woman" whose mother is Puerto Rican but you don't look it, what's the best way to be a responsible rapper? Can you locate the spot your ex occupies in your brain through MRI scanning? Those are some of the questions my guest today has asked herself, and that should give you a window into how interesting her thought process is. Her name is Dessa. She's a raconteur rapper and slick singer who studied philosophy and dabbled in poetry before joining a Minneapolis collective called Doomtree. Dessa and I talked about her early days with that crew as well as some of her many creative endeavors since then including her contribution to the Hamilton mixtape at creator and star Lin Manuel Miranda's invitation and her upcoming book of essays called My Own Devices: True Stories from the Road on Music, Science, and Senseless Love, out in September. In my opinion, Dessa also wrote one of the most powerful songs of the #MeToo movement called "Fire Drills" from her latest album Chime. Hear Dessa perform that live song and more in the player.